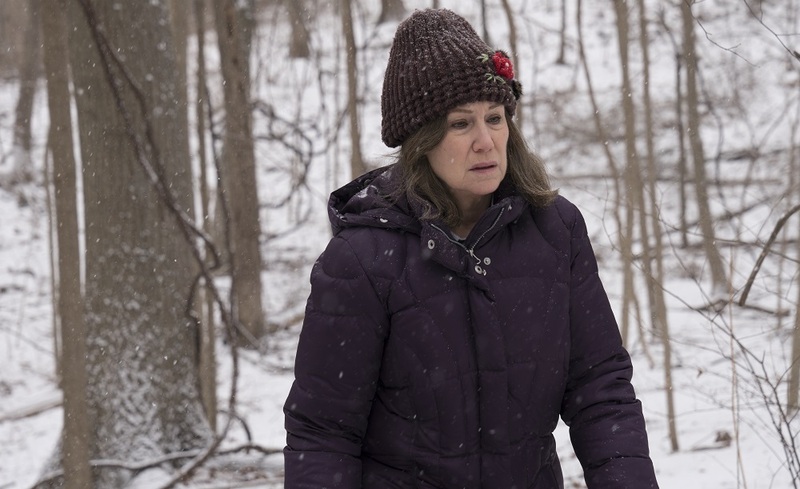 Diane (Mary Kay Place) is a pro at putting others before herself. She spends hours at the hospital trying to cheer up her cousin Donna (Deirdre O’Connell) as she battles cancer. She volunteers at a local soup kitchen with best friend Bobbie (Andrea Martin). Mostly, the small-town Massachusetts native works overtime to keep checking in on her drug addict son Brian (Jake Lacy), hoping that one day all her motherly smothering will influence him to get clean for good so he can do something positive with his life. Diane does all of this and more, thinking that if she can give enough of herself over to assisting in the welfare of others she’ll someday be able to quiet past demons that have doggedly haunted her for much her adult life. 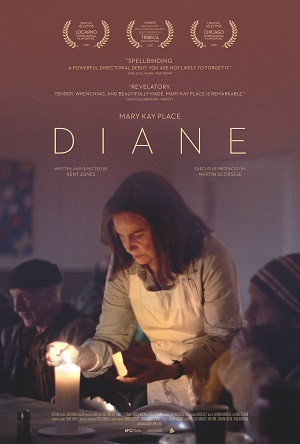 Diane is the feature-length narrative debut for documentarian, author and film historian Kent Jones (Hitchcock/Truffaut). This is a leisurely paced, delicately balanced drama of a woman trying to do the best she can for everyone and anyone she even passingly becomes connected to during her life, oftentimes doing so by placing her own needs towards the bottom of her priorities list. It is a movie rooted in the human connections between friends and family, especially as they pertain to mothers and sons, the inability to forgive one’s self for misdeeds both real and imagined leaving a lasting scar that will never heal. There’s not a lot more to it and that’s just fine. Unlike Ben is Back or Beautiful Boy (other recent efforts revolving around somewhat similar themes) Jones isn’t all that interested in detailing all of the ins and outs of a parent dealing with an adult-aged child battling drug addiction. Because of this, the conversations Diane and Brian engage in are authentic and truthful, their pointed brevity having a viscerally lacerating edge that’s psychologically lethal. But this is just one of the various stories hidden at the heart of the character-driven puzzle the filmmaker has constructed, each piece sliding easily into place alongside the one next to it in order to craft a fully-formed picture of one woman’s life in all of its magnetically idiosyncratic minutia. There does come a point where Kent begins to fast-forward in time, these leaps typically happening after the death of a close friend or loved one to either age or illness (or a combination of both). While these happenings are natural, each coming in a manner that does not feel calculated or overtly melodramatic, they do have the unfortunate side effect of causing the last third of the film to move in herky-jerky fits and starts. 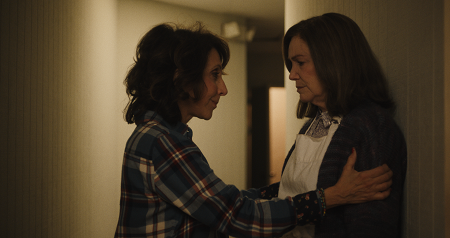 The flow of the picture becomes more episodic during it climactic act, and as such I felt like my connection to Diane was slightly damaged just at the very point I was supposed to be embracing her with open arms as tears streamed down the side of my face. Having an actress as commanding as Place proves to be is the ultimate difference maker as far as my caring about any of those relatively minor missteps is concerned. This might just be the best performance I’ve seen from any actor this year, and considering my immense affinity for Julianne Moore in Gloria, Lupita Nyong’o in Us and Dev Patel in The Wedding Guest that’s saying a heck of a lot. The award-winning actress is marvelous, and as she’s in practically every scene of the film that this is a good thing is an obvious understatement. Place manages to twist herself physically and emotively into such pretzel-like knots I was astonished by the emotional magnitude of what it was she was doing. It’s spectacular stuff, and I can pretty much guarantee I’ll be thinking about the actress and what it is she accomplishes as the titular character for the remainder of 2019. There’s a wonderful scene late in the movie where Diane is at a dinner party hosted by Brian after he’s gone through another stint in recovery and discovered newfound religious fervor. It’s great mainly for the manner in which it showcases how people can every so often talk over one another in such a way no one hears anything that anyone else is trying to say. It also helps put into additional context the diverse ways in which Diane looks at the world. While she is selfless in her philanthropy, goes to church and volunteers at a soup kitchen, she just as clearly also doesn’t want religion shoved down her throat, choosing to discover her connection to spirituality and faith in her own way and at her own pace. This adds an additional layer of unforeseen conflict between mother and son that’s made all the more uncomfortably bruising when the truths fueling Diane’s internalized torments are finally revealed. I can’t say I’m surprised Jones’ first fictional film is as confident and as handsomely made as this one proves to be. The director is an accomplished writer with a uniquely personalized voice and Hitchcock/Truffaut is as meticulously constructed a documentary as any I’ve had the pleasure to watch this decade. Here, he not only gives Place the role of her career but he also allows supporting players Lacy, Martin, O’Connell and Bonnie and Clyde Oscar-winner Estelle Parsons a few individualized moments to shine. Jones allows his actors and his scenario equal room to breathe and evolve, the film having its own sense of ephemeral fluidity that’s richly absorbing and dramatically distinctive. 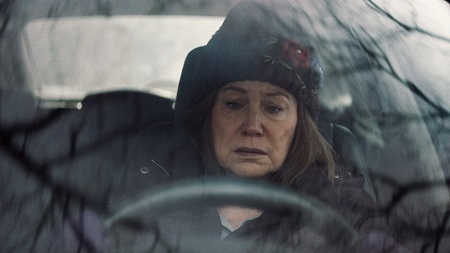 This feeling is augmented considerably thanks to Wyatt Garfield’s (Beatriz at Dinner) austere cinematography and Mike Selemon’s raw, uncompromisingly severe editing style, all of this giving Diane an impassioned layer of poignant specificity that’s superb. There’s much to love here beyond Place’s stunningly magnificent performance, Jones delivering a striking drama of introspective precision that’s almost impossible to resist.